She is known around the world for her dazzling smile and heart-melting voice - and Mariah Carey did not disappoint as she drew in an ecstatic crowd in the Middle East. The 46-year-old bronzed star showed off her toned curves in a stunning sequin slit dress with an enticing neckline, yet again flaunting her age-defying figure. Mariah took centre stage in the Arab playground’s Media City Amphitheatre during the Dubai Jazz Festival, where she was joined by singers including Brit Tom Jones. The multi award-winning singer, songwriter and record producer performed her classic hits including 'Hero', 'We Belong Together' and 'Always be my Baby'. Revealing a new single, Mariah gave a rendition of her new song 'I dont' to an enthusiastic crowd. The superstar, whose sparkly ensemble was designed by LaBourjoisie, also honored recently deceased British pop icon - and her close friend - George Michael. Flaunting her long, bouncy golden curls as she belted into the microphone, the singer looked radiant and caught up in the lilting melodies. The week may not have been an easy one for the star - though she looked completely at ease, just two days after her ecstatic ex-husband Nick Cannon announced the birth of his new son across social media. The veteran singer previously took centre stage in the Arab playground’s Media City Amphitheatre on Thursday, where she was performing for the first time since Cannon broke his happy news. 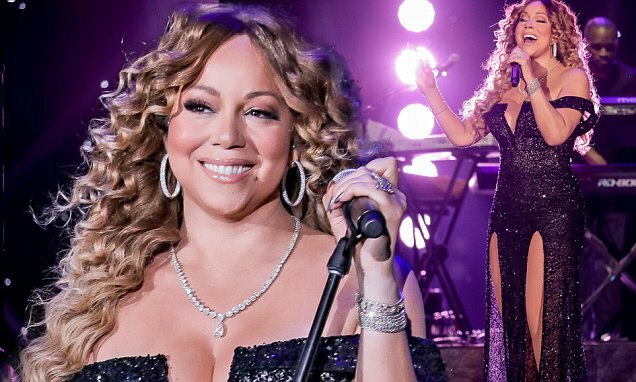 Dusting off some of the better known tracks from her extensive back catalogue on Thursday, Mariah looked elegant in a heavily embellished maroon gown that accentuated her famously voluptuous physique. Seemingly in high spirits, the powerful singer struck a series of coquettish poses beneath the hot amphitheater lights while working her way through a lively set.